This tutorial provides you with a foundation for working with Adobe InDesign styles. It is the third lesson in the Adobe InDesign CC Digital Classroom book. For more Adobe InDesign training options, visit AGI’s InDesign Classes. In this exercise, you will create a style and apply it to a headline. 1 In the Pages panel, double-click the page 2 icon. 2 Select the Type tool ( ) from the Tools panel. 3 Select the text in the headline What is the next innovation in cell phones? 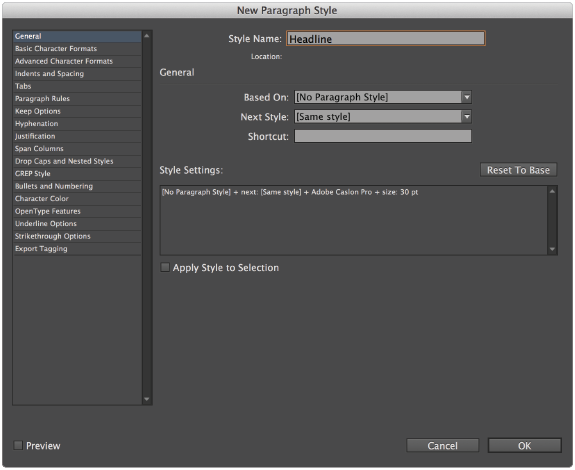 4 Choose Type > Paragraph Styles or click the Paragraph Styles button in the panel docking area. The Paragraph Styles panel opens. 5 Click the panel menu button ( ) in the upper-right corner of the Paragraph Styles panel and choose New Paragraph Style. In the Style Name text field, type Headline, and then click OK. The new style contains the text attributes from where the cursor was located when you created the new style, including font, style, color, and spacing. Creating a new paragraph style. 6 Select the Headline style in the Paragraph Styles panel to apply the style to the text. The appearance of the text does not change, but the text is now attached to the style. If the style is updated, the appearance of this headline will also update. 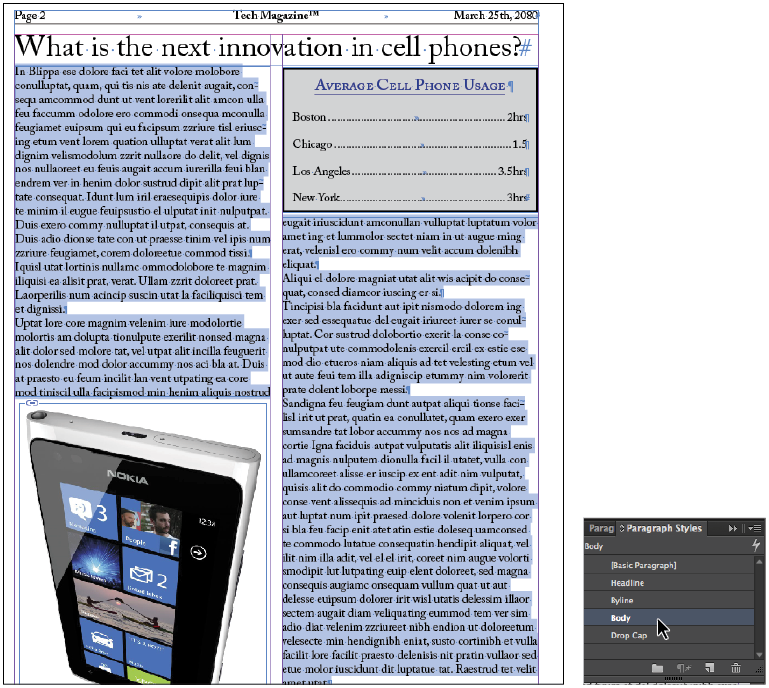 When you create a new style, you can also have InDesign apply it to the current selection. In the General section of the New Paragraph Style dialog box, select the Apply Style to Selection check box. 7 On page 3, click to place the cursor in the headline When is the best time to update equipment? In the Paragraph Styles panel, select the Headline style to apply it. The headline is formatted with the paragraph style you created. You can import styles from one InDesign document to another, making it possible to share formatting across various documents. In this exercise, you will import a Drop Cap style from another document and use the style in this document. 1 In the Paragraph Styles panel, click the panel menu button ( ) and choose Load Paragraph Styles. You will locate a file from which to import a style. 2 In the Open a File dialog box, navigate to the id03lessons folder and select the id0301_done.indd file. Click Open. 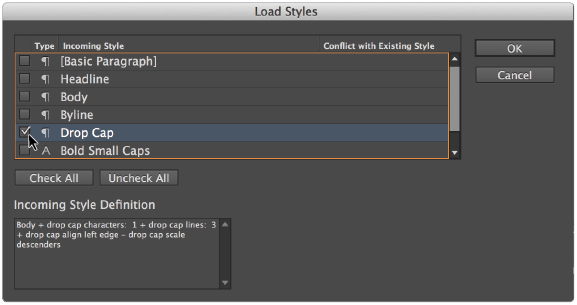 The Load Styles dialog box appears. 3 In the Load Styles dialog box, click the Uncheck All button to deselect all the styles, because you will only import one specific style. Select the Drop Cap check box to select only this one style. Loading the Paragraph style Drop Cap. 4 Click OK. Drop Cap is now added to the styles in the Paragraph Styles panel in your document. In the next exercise, you will update an existing style, and then apply the Drop Cap style. You will now update the Body paragraph style to contain a new attribute, which will align the text to the baseline grid you specified earlier in this lesson. 1 Navigate or scroll to view page 2. 2 Choose the Type tool ( ) and click in the text frame containing the story on page 2; then choose Edit > Select All. 3 Select the Body style in the Paragraph Styles panel to apply this style to all the selected paragraphs. 4 If a plus sign appears next to the style name, press and hold the Alt (Windows) or Option (Mac OS) key and select the style name again. This removes any formatting changes that have been made since the style was applied. Changes made to text after a style has been applied are known as overrides. If you edit a style attribute outside the Paragraph Styles panel, the style is manually overridden, and a plus sign displays next to the style name in the styles panel. If you place your cursor over the style in the Paragraph Styles panel without clicking, and pause, a tooltip appears. The tooltip identifies which attribute is causing the override. 5 In the Paragraph Formatting Controls section of the Control panel, click the Align to Baseline Grid button ( ). 6 In the Paragraph Styles panel notice that a plus sign (+) is displayed next to the style name. This plus sign indicates that the style was changed after it was applied to this text. You changed the text by aligning it to the baseline grid—something that was not part of the original style definition. Next you will change the style so it includes this change as part of the definition of this style, and all text using this style will include this modification. 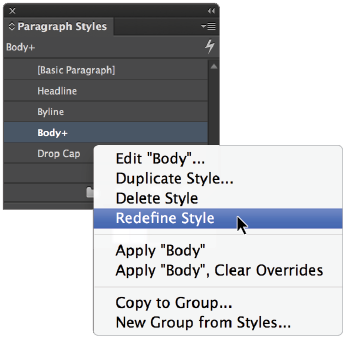 7 In the Paragraph Styles panel, click the panel menu or right-click (Windows) Control+click (Mac OS) on the style name, and choose Redefine Style. All the text styled with the Body style now aligns to the baseline grid. 8 Click anywhere in the first paragraph of the story. In the Paragraph Styles panel, click to select the Drop Cap style. The first paragraph is now formatted with the Drop Cap style, and the rest of the story is formatted using the Body style. 9 Choose File > Save to save your work. Text placed on a path can follow a line or shape, such as the outline of a circle, square, or an arc. 1 In the Pages panel, double-click page 4 and navigate to the logo at the top of the page. If necessary, increase the magnification to zoom-in on the logo containing a green arrow using the Zoom tool (). 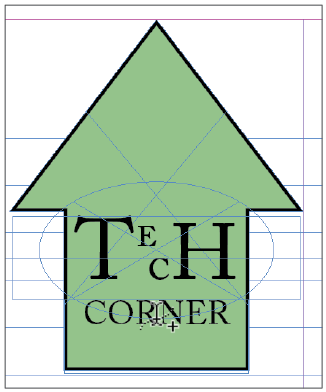 2 Notice that there is an oval surrounding the word Tech in this logo. 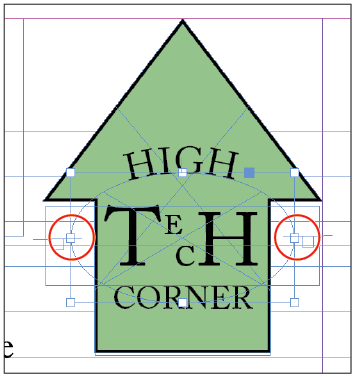 The logo should read High Tech Corner. You will place the word High on the oval. 3 Click and hold the Type tool ( ) in the Tools panel until the hidden tools are revealed, and then choose the Type on a Path tool ( ). 4 Move your cursor over the bottom center of the oval until you see a plus sign appear next to the cursor, and then click once. are able to place text on the path. 5 Type HIGH, and then highlight the text using the Type on a Path tool by clicking and dragging or double-clicking to select the word. 6 In the Paragraph Formatting Controls section of the Control panel, click the Align Center button ( ). You will adjust the exact position of the text in the next steps, as the text may be positioned upside-down or along the bottom of the circle. 7 Choose the Selection tool () from the Tools panel. Notice that there are two vertical handles that appear directly to the left of where you clicked on the path. These are handles and they mark the starting and ending points for the text on the path. 8 Select the left-most vertical handle that appears along the path and drag it clockwise, stopping when the line is centered between the top and bottom half on the right side of the oval—where the 3 o’clock location would be on a clock. If the text moves so that it is placed inside the oval as you are moving the handle, choose Edit > Undo and repeat the process, carefully following the oval as you drag clockwise. Be careful to not click the boxes when you move the handles, as these boxes are the In and Out Ports, which are used for flowing text into and out of the path. 9 Take the handle that marks the ending point of the text and drag it counterclockwise, positioning it so it is centered along the left half of the oval—where the 9 o’clock location would be on a clock. Because you had already centered the text, aligning the start and end points of the text to the opposite sides of the circle lets you know that the text is centered correctly. The new start and end points of the text. 10 Choose File > Save to save your work. To center text on a path you can also click the bottom of the circle using the Type on a Path tool (). This causes text to start and end at the bottom of the shape and you can quickly center the text by setting the paragraph alignment to align center. See available InDesign Classes and learn from the expert instructors at American Graphics Institute. In-person classes at our locations, online courses, or private training is available. See our InDesign Classes and learn from the expert instructors at American Graphics Institute in small classes or through private training.